UPTOWN — Building code violations at the Riviera Theatre and Aragon Ballroom in Uptown have earned owners of each building a Wednesday date in housing court, where they face hundreds of thousands of dollars in fines. Both concert venues have exterior code violations that fail to comply "with the minimum standards of health and safety set forth in the building code," according to separate complaints filed in Cook County Circuit Court earlier this year. Both historic venues, along with the Uptown Theatre, are touted as pillars of Mayor Rahm Emanuel and Ald. James Cappleman's plans for a beefed-up entertainment district in Uptown. Jerry Mickelson's Jam Productions, which owns the Uptown Theatre, also is behind the LLC that owns the Riviera. A spokesman with the city's Department of Housing and Economic Development said a redevelopment plan from Mickelson to restore the Uptown Theatre should be completed "early this summer." But there are "still some code issues they need to take care of," before then, he said, referring to the Riviera, which was built in 1917 and designed by the architectural firm of Rapp and Rapp. The firm designed more than 400 theaters, including the Uptown and the Chicago Theatre in the Loop. 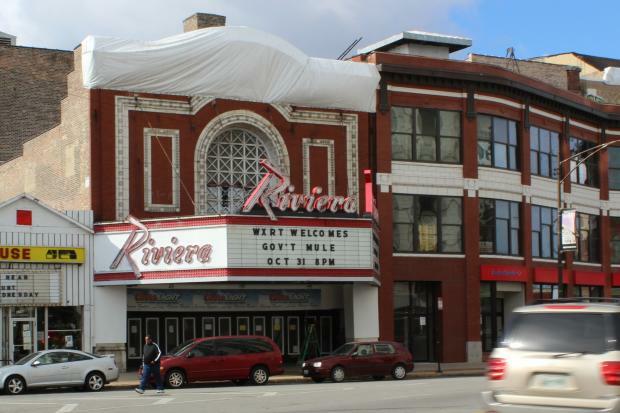 The Riviera's owners allegedly "failed to maintain the exterior stairs, [the fire escape], in safe condition and sound repair," and also failed to keep the building's exterior walls "free from holes, breaks, loose or rotting boards or timbers and any other conditions which might admit rain or dampness to the walls." The city asked the building owners to remove the temporary tarp that covers the building's "distressed terra cotta," and repair or replace "all loose and fractured terra cotta." As of Monday, the tarp remained. The complaint seeks a $1,000 fine for each day the violations have persisted. Wednesday will mark 274 days since the violations were noted, according to the complaint — meaning the owners could face at least $274,000 in fines. Mickelson could not be reached for comment. The Aragon's fines are potentially higher. Come Wednesday, 112 days will have passed since the city noted violations at the Aragon, which is being fined $4,000 for every day. That means the owners could face at least $448,000 in fines. Mickelson's Jam Productions is one of the primary promoters bringing acts to the venue, but does not own it. The folks behind Aragon Real Estate LLC, the venue's owners, are Luis Rossi and Ivan and Mercedes Fernandez, according to records. The Aragon is accused of an array of exterior code violations for failing to keep the exterior walls "free from holes, breaks, loose or rotting boards or timbers and any other conditions which might admit rain or dampness to the walls." The city also alleges numerous cracks, fractures and other structural defects in the masonry, windows and terra cotta as well as fractured, loose and "eroding mortar" in various locations, among other violations. The Aragon was built in 1926 and designed by Huzagh & Hill to resemble a courtyard in a Spanish palace with majestic arches and balconies, terra cotta ceilings and mosaic tiles. The city claims that "the levying of a fine is not an adequate remedy," to ensuring the violations are taken care of and asks for an order authorizing the city "to demolish, repair, enclose or clean up," the buildings and, if necessary, order, "a judgment against defendants and a lien on the subject property for these costs." Asked if the housing court issues dampened confidence in Jam Production's ability to renovate and maintain the Uptown Theatre, Cappleman's chief of staff Tressa Feher said, "It's not really related, it's separate." Cappleman was unreachable for comment. The Riviera has failed six city inspections since 2010, and the Aragon has failed nine inspections in the same span. After being nearly shut down by the city for building code violations, the Congress Theater in Logan Square passed inspections in April and was allowed to remain open.